An involtini is an Italian word for a roll-up. In this recipe, creamy ricotta is rolled velvety eggplant strips. Before you squeeze the lemons, zest them with a Microplane, and then cover and set the zest aside. Whisk the milk and lemon juice together in a medium pot. Gently heat the milk to 190 F (88 C) and then turn off the heat. Use a wire mesh spoon or ladle to encourage the rising curds to clump towards the center of the pot. Let this rest for 10-15 minutes. Use a perforated ladle to scoop the curds gently into a cheesecloth lined strainer and let them drain until the ricotta is about the consistency of Greek yogurt. You should end up with about 340 grams of ricotta. Take 170 grams of ricotta and mix it with 1/2 teaspoon of lemon zest, parsley, salt and pepper. Save the rest of the ricotta for something else. Trim the stem off the eggplants. If you are using a full-size Japanese or Chinese eggplants, cut them in half so that each piece is about 4.5-inches long. Slice each piece lengthwise into 1/5-inch (5 mm) thick slices. Line a wire rack with paper towels. Add the olive oil to a pan along with the garlic and thyme and fry until the garlic is sizzling and fragrant. Fry the eggplant in batches, flipping them over once until they are tender and then transfer them to the paper towel lined rack. You'll want to remove the garlic and thyme from the oil at some point before they start to burn. Pat any excess oil off of the fried eggplant with paper towels. 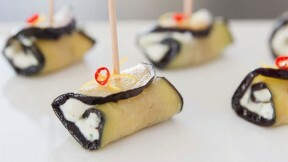 To make the rolls, spread a thin layer of ricotta onto each slice of eggplant and then roll it up. Skewer each roll with a toothpick and garnish with some lemon zest.